appalachia | Friends of Paint Lick,Inc. Somehow we missed among other things, the 20th anniversary in July of this article about one of our beloved volunteers at Friends. Katie Rollins is actually much more than a “volunteer”. In so many ways she represents the soul & spirit of Friends of Paint Lick and the legacy of Dean Cornett. We thought about adding a picture of Katie, but couldn’t decide if it should be a picture from 20 years ago or a more recent one. So for now at least we’ll go without one. Katie has changed (for the better) her appearance & a lot more. Maybe the word ‘experience’ would be better than change. She would be the first to say she is a lot wiser! The Village of Paint Lick has changed the most in those same 20 years. Take time to read this article as it appeared in the New York Times, July 1991. Economic crunch is still with us; Uncle Tom’s is gone; thanks to Dr. John & his staff at the clinic, the healthcare in Paint Lick is dramatically improved. As we remember the 10th anniversary of 9/11 this week try to include all the good things before and after which will surely give us all a better perspective. Realted Post: Christian Ministry in a post 9/11 world. Don’t count us out just yet. The flood has us down, but working hard to get up. In 2006, the Lexington Herald-Leader ran a feature on our village of Paint Lick and entitled it “Don’t count it out “. Four years and one big flood later has some of our first generation residents worried about the village they have come to love. Debbie Parker has worked harder this week at Friends than most anyone. Loraine came home Monday singing her praises and saying what a God-send she was. Yesterday she showed me something she had sat down and written to share the burden of her heart. 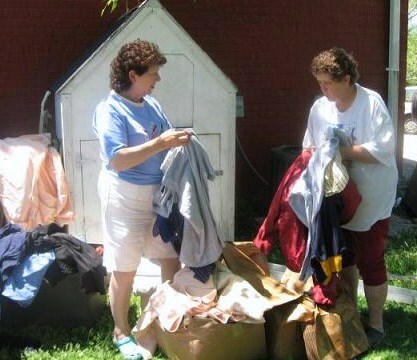 Debbie (on the right) sorting the wet clothes with Janet. IT IS NOW THREE DAYS since the flood and I’m thinking, “ Will this be the nail in the coffin of our little town of Paint Lick”? I moved to this community known as Paint Lick in February, 1960, from the coal fields of Harlan County. My dad was a coal miner. It was a thriving community of three grocery stores, a post office, the mill, Peoples Bank, two service stations, a restaurant, the Sportsmen’s club Eva Lee’s beauty shop, Earl Nave’s barber shop, J.R. Television repair. . .just to name a few of the one’s from the memories of a young child. As the years went by there have been numerous floods,fires, and tornadoes that caused changes both good and bad. The bad economy almost got us in the eighty’s, but still our heart was beating strong. We lost the Ashland station about this time. We are a community that cares about each other. When a tragedy happens, the people of Paint Lick are there lending a helping hand. Rumors began to circulate that we were losing our post office, but thank God, at least for now we still have her. In the late ’80s and early ’90s we lost the grocery stores of Calico and Brown, and Herlin McQuerry’s.The mill is long gone. About that time, The Friend’s of Paint Lick was formed by Dean Cornett who was also responsible for praying Doctor John Belanger to Paint Lick. He and his staff has provided us with the Family clinic which also suffered extensive damage. The bank changed to First Southern and we got a world-class wood shop in the person of Don Weber. He came to us from Wales via California, in an old green Chevrolet truck. Don has brought national attention (television) to Paint Lick. Of course it was Dean Cornett as one of President George Bush, Sr’s, “Point of Lights” recipient that first gained national attention for Paint Lick. So many people who have been a vital part of our community are no longer with us: Joe and Helen Adams, Dud and Eva Lee Hurte, Charlie and Maxine Brown, Franklin Dillion, Lucien, Geneva, and Ralph Starnes, Maggie and Otis Gooch, Jessie and Gladys Miller, Rudy Hensley, and others too numerous to list here. All are still remembered as a vital part of our heritage. Now we are in the twenty-first century and we have lost our restaurant to a fire and no longer have a station that sells gas. The days of the post office is on it’s way out. I guess what I’ve been trying to say is that the heartbeat of Paint Lick seems to be fading. Only we, the community can act as a defibulator to shock it back to a healthy condition. I don’t want Paint Lick to just be a memory. We dare not let this flood be the occasion that delivers the death toll. Let’s do something, whatever it takes to show there is still life here where we live, play, and work. I care deeply about my community and am willing to join others to get the heartbeat strong and dynamic. As the saying on Dean Cornett’s truck reminded everyone that saw it- “Press on Regardless!” Let that be our rally cry as we work together to bring back the life-force to Paint Lick. Related article in 1991 New York Times about Katie Rollins and the hard times Debbie speaks of in the ’80s in Paint Lick. When Dean Cornett met John Belanger she knew God had answered her prayers; her dream of many years was about to become reality in the Village of Paint Lick. Dean had worked in social work for many years and of all the challenges that folks had none was greater than the health issue. Yet the health issue, especially the access to the medical community seemed a major barrier for most of the folks Dean worked among. She dreamed of having a local doctor and clinic that would be much more like the family doctors of the past. Like the ones who had played such a vital role in the history of the community called Paint Lick. She recognized in John Belanger a fellow dreamer, and the more she got to know him, turns out they had the same dream. Dr. John received a distinguished award this year and his work at Paint Lick has received recognition from far and near. Ted Cox has a very good article in this week’s Central Record that you can read at this link. For those of you out of the area this will serve as an introduction to one of Dean’s most satisfying projects: bringing loving, affordable, and quality care to the folks she loved and served so long. This is one way to reform healthcare, and Dean and Doctor John were “all over it”. So, from all of your patients, congratulations Dr.John and thank you for supplying the fulfillment of Dean Cornetts dream and bringing the best of heathcare back to the Paint Lick community. Our heartfelt thanks to all the team at Paint Lick Clinic.